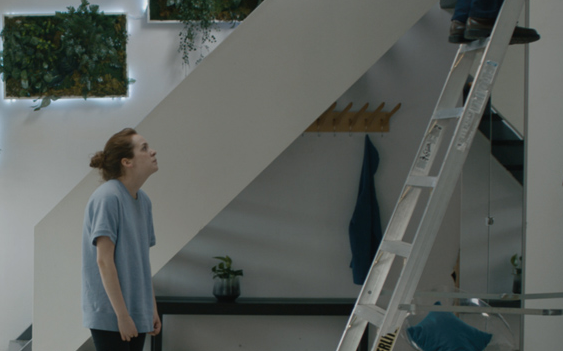 Resembling a lost story from Netflix’s Black Mirror universe, Lorette plays a woman who is attempting to record a video of herself only to be interrupted by a repairman (Tom Rooney), and then an emergency drill. The test seems to be routine for the woman, but she’s forced to react in the moment when her well-being is at stake. 7A is inferior to Russell/Lorette’s breakout endeavour She Stoops to Conquer, but it’s because their latest is much more simplistic than a layered theme piece. Mind you, when compared, I believe they’re much stronger in an abstract element than an obscure one. However, with what the audience is given, 7A is a decent sci-fi short featuring an unpredictable ending and a memorable manic performance from Kayla Lorette, who continues to prove herself as a versatile performer.